The Duke Ellington Bridge on Calvert Street between Woodley Park and Adams Morgan is currently closed while the Bomb Squad handles a suspicious package. In light of the outstanding threat, the overwhelming response from MPD and the Federal Protective Service bomb squads is mostly precautionary. The L2 bus, amongst others, has had its route split in half, and traffic through the area isn’t moving at all. 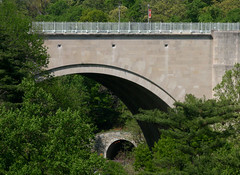 I would avoid Connecticut Avenue up through Woodley Park for the time being, and likely the Rock Creek Parkway beneath the bridge. Update: As of 10:00am the Bridge is again open.